First things first. The word “espresso” refers to the way coffee is brewed not to the coffee itself. Espresso is brewed by water that is forced up threw finely ground coffee because of steam pressure; in America especially, “coffee” is generally made in a percolator or via the drip method. The latter actually ends up having a higher concentration of caffeine, while the former tends to be thicker and richer in flavor. Put another way, espresso is always coffee, but coffee is not always espresso. That said, it is important that if you want to make espresso in a moka pot, you get finely ground (often called “espresso grind”) coffee as other types are too coarse. Some people might argue that coffee made in a stovetop moka isn’t *really* espresso since it doesn’t tend to create the gorgeous layer of golden brown “crema” on top, but really since it is indeed brewed via pressure coming up from the bottom, it is. It’s not going to taste exactly like what you get in a bar (remember in Italy, the place where you get coffee is called the “bar”), but quite simply, for many of us in Italy and elsewhere, making this type of coffee at home is just the most cost effective choice — we also find it quite delicious as well. 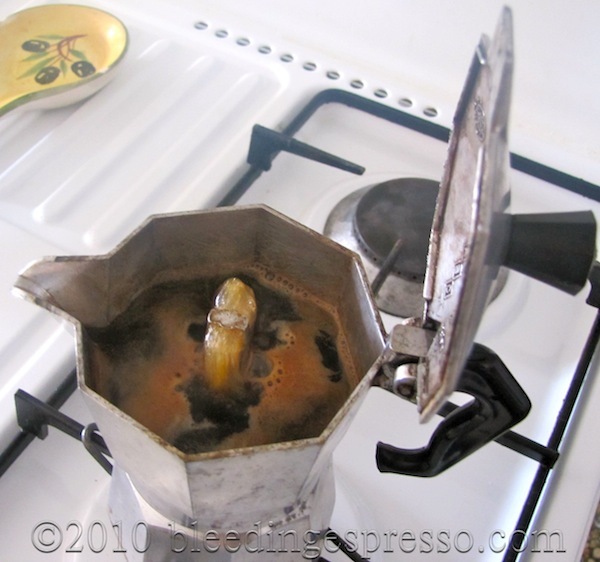 Where did the moka pot come from? The moka pot was created by Bialetti and rose to popularity in Italy in the 1930s; the basic design has been copied ever since, and there are also different moka pot looks, so feel free to experiment. Moka pots also come in different cup sizes (ahem), so it’s not uncommon to see several different sizes of moka pots in an Italian house for use with different numbers of guests. 1. 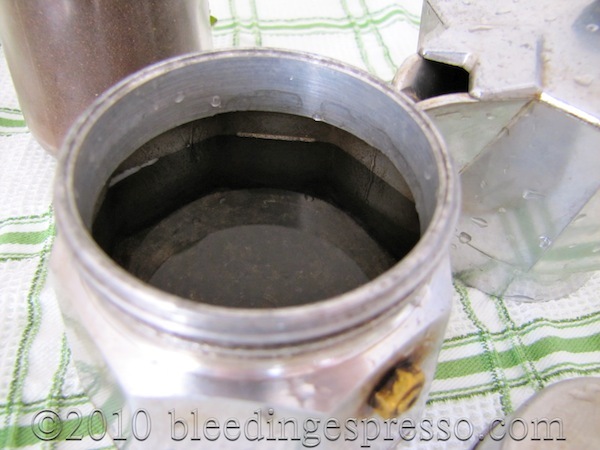 Fill the bottom with fresh, cold water up to the middle of the safety valve; as you can see in this photo, my moka has a line that marks that level in various places around the bottom, which makes it even easier to tell where to fill to. Bottom of moka pot filled with water. 2. Put the basket in the bottom, and spoon in the coffee. This part you can experiment with, depending on how strong you like your coffee. As you can see, we like ours pretty strong, but you can fill yours considerably less — the most important thing to remember is not to pack it down. Basket really full of coffee. 3. Screw the top onto the bottom creating a super-tight seal. I use a towel for extra traction to really get that last turn tight. Then put the pot on the stove on low heat. Moka pot on low heat. 4. The top part of the moka will begin to fill with coffee. When you start to hear the sputter and gurgle of the coffee, remove it from the heat. P.S. Don’t lift the lid as I did for the sake of photos. There is very hot coffee spurting out of there, and it doesn’t care what’s in its way. 5. Serve hot, with or without sugar, with or without steamed milk, just however you like it. Steaming cup of espresso made in a stovetop moka pot. When cleaning the moka, I have been told to never use any kind of detergent on it at all, so I don’t (just hot water and my hands). I have seen recommendations online to use a mild detergent, but I’m going to stick with what the locals here tell me. 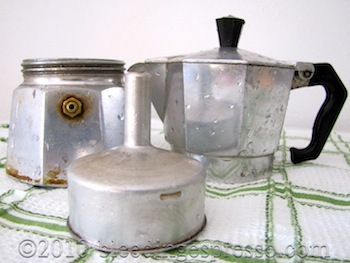 I do, however, take a scouring pad to my moka pot now and again to keep it looking mildly shiny, but as you can see from the photos, mine isn’t exactly new. Ah, and that’s another thing about using a moka pot — throw out at least the first batch of coffee made by it, possibly even two or three batches. The flavor is just going to keep getting better the more you use it, so if your pot starts experiencing problems (the coffee is leaking out the sides at the seal or the top part isn’t filling up with coffee), I’d say to change the rubber ring that creates the seal. The replacement ring costs 15 cents (here at least), and it’s well worth a try before you start over with a new moka pot IMHO. How do you drink your espresso? Cool. I remember asking you about how the moka pots worked a long time ago, but it’s still nice to see how it all actually happens. I prefer Vietnamese individual drip filters or French presses myself. To be honest, I haven’t yet met a coffee-brewing method I don’t like. Those little beans just have me hooked 😉 Glad you enjoyed! That’s how my mil makes her coffee. I got an electric Moka for Christmas last year and like strong coffee! You were a good boy last year, Gil — you deserved it! Strong coffee rules! Woohoo! I am doing it right!!!!!!!!!!!!!!!!!!!!!!!!!!!!!! Thanks I really liked that. Haha what a relief, eh? 🙂 Thanks for coming by Marshall! Remember if putting the pot away for a while (like going on vacation, etc.) to fill the coffee basket with sugar to prevent the coffee oils throughout from going rancid. lol Now I’m getting a craving for coffee..great post! I learned how to make coffee in this pot before I was out of elementary school! And the “not packing it down” is essential. Since I bought mine, I don’t even mess with the drip brewer anymore! And the Hubs found out the hard way that the Moka is NOT to be washed, lol! Glad you’re enjoying it Beth! Thanks Laura; you know, I don’t think I’d make it on the Amalfi coast…I’m *so* not a lemon girl! I don’t drink coffee but was going to buy a Moka in case a friend was over and wanted some. Now I will know how to make it. Grazie mille. Thank you! I didn’t pay close enough attention when in Italy, and now I know!…..smiles. We bought a Moka pot right after we got back from our first trip to Italy. Sadly, it has only been used a few times, as the coffee turned out too bitter for my tastes. Was it the grind I was using? Or the fact I packed the coffee into the basket? I’m going to try again, with your instructions in hand. Thanks for this! My husband has worn out more than one pot from overuse, and one of the most important items are those rings. Lucky for me I can buy them now in the USA at a specialty kitchen shop. They are definitely easier to find in the US now than they used to be! Excellent, Michelle, love the detailed pics! Thanks for this Michelle. This is a method of making coffee I first learned from my Doktorvater, who was from Milan, while writing my dissertations. We would sometimes hold our meetings over lunch at his house in Kensington, MD, and he would always make a pot of coffee in moka after lunch. I glad to have this now too, because I am going to send your article to a friend of mine, who insists on doing two things: packing the grounds down, and using a high heat when “cooking” the coffee. I’ve tried to explain this to him many times, but he just doesn’t listen! Maybe he’ll listen to you. I don’t know, Daniel…that’s a lot of pressure on me! 😉 Good luck though! I have one just like it , when in Sicily I commented to my aunt the reson I don’t use my pot too often is that it would always spill over onto the stove as I have an electric range and I feel with the das you have more control. She brought out from her kitchen gadget drawer this little hollow hat crown looking thing that sits right over the tip of the esspresso flow valve , this prevents spitting she says , we get some at flea market , and we did and now… no spitting and lots more essspresso. I’ve seen some of them sold with that little thing…interesting! One more thing never type without glasses on! Hahaha; that’s a good tip about storing them, thanks! Great mini-lesson. One other tip an Italian friend gave me: When the coffee grounds “stick” in the basket after use, lean over your sink or trash basket and blow through the tube. A good puff somehow dislodges the grounds. 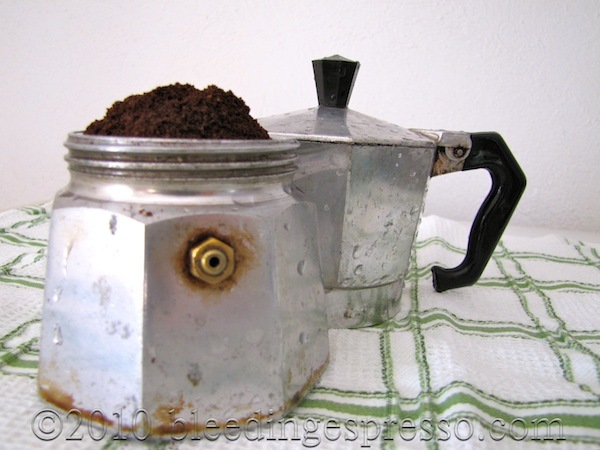 … a moka pot makes a beautiful present for holidays ! Hope you find your photos! This was very timely for me, thanks. I have a Moka pot my husband gave me 35 years ago when we first met. I even still have the note he enclosed with it when I was still uncertain of his feelings for me. The note confirmed it all and we have been married for 32 years. But…I am still not clear on the proper use of the word espresso. We Americans think we have to buy Italian coffee labeled “espresso.” You say that word only defines the method. OK, well and good. So if we use our favorite American style “coffee” in it is it still called espresso or is it coffee? Sorry for my desire to be so exact, I guess I’m just that way. So…any coffee we like will still work in the Moka? I am glad to hear that and am going to go try it right now. One of the first gifts from Valentino was a Moka and then the lesson in how to make the espresso – by our honeymoon we were gifted with several other styles from a ‘Napolitani’ to pots with ceramic handpainted tops. Needless to say I am now an avid ‘collector’f all shapes, all sizes. Right now is a great season to enjoy espresso with eggnog instead of steamed milk or cream! I love my moka! I’m about to head to my lovely Buenos Aires for two months and I’m bringing the moka with me. They do have them there (50% of the population is Italian) but they are incredibly expensive. So, I just bring mine. Mine starts its gurgling noise before the coffee starts coming out. I love the coffee that I get from my moka but it’s a little bizzare to hear the gurgle and happily rush to the stove to find that it’s not ready yet. 🙁 Ever heard of that happening? Sounds like your coffee is blocking the little holes and not allowing the water to come up…could be that the rubber rim is clogged with old coffee, so be sure to get in there and clean it out really well. You’d be surprised how much gets trapped in there! I know I was when I took my first rubber ring out! In Naples you can buy a cappelino or little hat to stop the coffee spurting in an uncontrolled way, this means you can watch the coffee coming out. In our house making coffee is a mystical ritual undertaken only by the Neapolitan husband and the truth is if I try to make it, the taste just isn’t as good. Yes, I don’t like most run of the mill American coffees. I prefer to buy organic beans and grind them so I will now simply grind them fine enough for my Moka. I have used the pot over the years but always assumed I had to buy Italian coffee such as “Illy” to get true Italian “espresso.” Anyway, now I will use my favorite coffee, finely ground. Thanks, Michelle! I did not know there was a special Pot for Moka Coffee! There something new to learn everyday, even if they are not real news! This is one of the three ways we make coffee in our house (the other two being a French press and a vintage stove top percolator.). I love my Moka pot! Mmmm excellent coffee at your house! 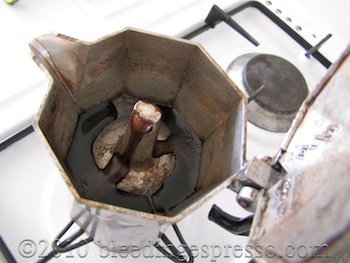 years ago, good friends of mine gave me a Moka Pot as a gift and for awhile I used it everyday. It’s been sitting in my cupboard since we moved (1 year ago) and now I’ve been inspired (by you) to take it out and start using it again! 🙂 Thanks. Nice to read a kindred espresso lover’s advice. In my small village north of Rome, I’ve found a place that imports beans from all over…Haiti and India are two of my favorite bean places. Who needs sugar when the coffee is so good! Thank you! 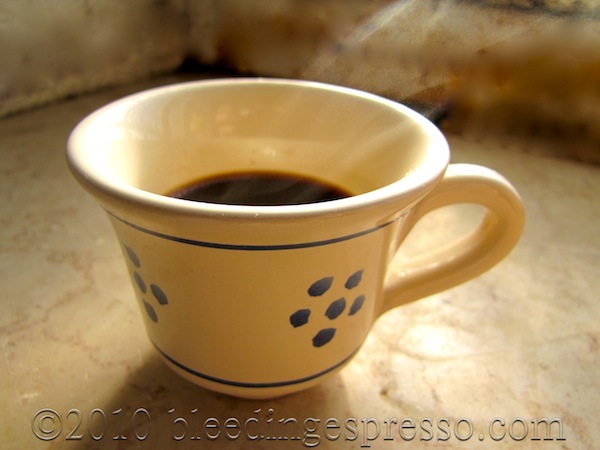 I am a new “transplant” to Italy (Naples) and it appears that we’ve been using or Moka all wrong. I love your step-by-step guide. I just bought my first Moka pot and have yet to enjoy a cup from it. I did “season” it tonight by making and discarding two batches of coffee. I was grateful to discover your blog, as I still have some questions that the instructions don’t address. I don’t want to burn the coffee so when should I turn the flame off, as soon as I hear the coffee gurgling? Or wait until the pot is mostly filled with coffee? Also, am I supposed to remove the white rubber ring? Mine is seated firmly next to the filter on the pot. It didn’t seem like it wanted to come out and I didn’t force the issue. So should I remove the ring after each use? Thanks so much for your advice. Hi Sophie, first of all *definitely* do not remove that ring. That’s what makes sure your moka pot is sealed tightly. You’ll need to change it once you see it starts getting loose and no longer creating a good seal (coffee may leak out the side of the moka while brewing, for instance), but it should be months at the least before that happens. And yes, turn off the flame as soon as you hear gurgling because that means there’s no more or very little water in the bottom of the unit to be pushed up to the top…if you keep the flame going, you’ll end up boiling the coffee, and you don’t want that. The top of the moka should be pretty full by that point anyway, so you’ll see that it’s ready to be turned off. Enjoy! 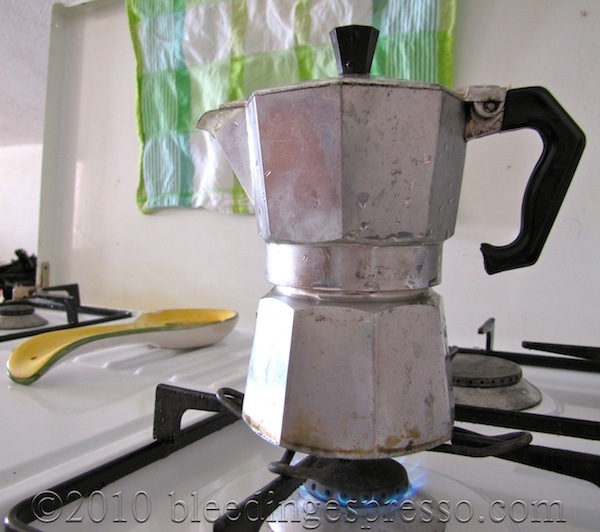 Here in Seattle, the other land of espresso, I have been using a moka pot for years. I consulted a few different resources including the knowledgeable owner of Seattle Coffee Works, who instructed me to tamp the grounds into the moka pot firmly but not excessively. The reasoning behind this is that the coffee must have a consistent density, otherwise little canals will form that the steam will go through and you will get inconsistent extraction (it will be bitter). The espresso will be best at the hottest possible setting on your stove. The hotter the water the better. My friend in the army told me his group actually used C4 explosives to make their espresso (by burning it, not exploding it) and said it was the best ever! If you have your range hot your moka pot will most certainly spurt and spit, better keep that lid closed. Can’t imagine what benefit there would be to having it open. Finally, I clean mine out frequently because the residue coating the inside of the top section lends an unpleasant flavor to espresso in my opinion. Found this site looking for info on making my own Brasilena. Will have to experiment on my own I guess. Happy espresso brewing!